Camp for us, when we were children meant all sorts of things. The word ‘camp’ defined, for us, a location and a way of life. It was a life of simplicity, far from the madding crowd. It was a life style, set against a backdrop of the South Downs that we all enjoyed. 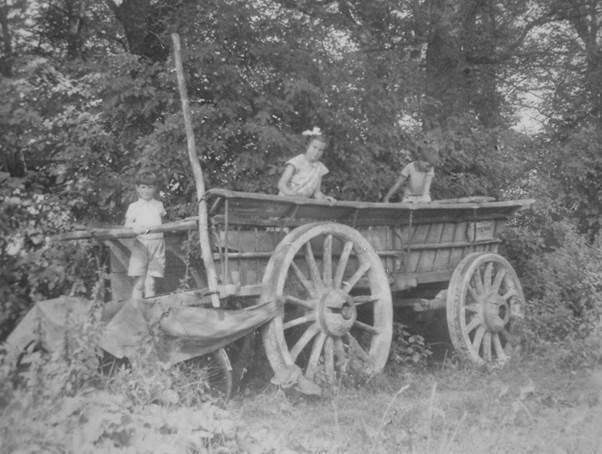 And here are four of the family enjoying a rest on a waggon on our home farm. The year is 1958 when my dad first tried colour. My mother is on the left and on the right we have my sister, me and my brother. I’d have been 9 at the time. My brother was 11 and my sister would have been close on 14. Dad is not in the picture. He was pressing the shutter on the camera. The waggon has clearly brought harvest to the barn and I dare say it was all pitchforked through that high door. Back then an awful lot of crop handling was done manually. The barn is clearly flint built. Those flints must have taken some finding but they produce a beautiful building. The roof material has probably replaced thatch at some date. The barn and yard made a wonderful playground for me and my brother. There was much to enjoy and a waggon, with imagination, was whatever we wanted it to be. Should that be wagon or waggon? Both spellings seem to be acceptable but that, of course, is not what this post is about. Neither is it about going dry after a bout of high alcohol usage. I’m not a teetotaller but I am a low consumer of alcohol. Many would say exceedingly low, but there is no principle involved. I find I can be silly without alcohol and to be honest I don’t much like the slightly out of control feel I get from booze. But I’m happy to enjoy a good beer or red wine or a glass of decent cider. It’s just that I drink them very rarely. So, not that at all. Rather this is about being on an old farm wagon. The year was 1954. This was a ‘camp’ activity. Youngsters today might find the life style hard to credit. We were stuck on the bare South Downs for three weeks. Books and games we had, but in limited supply. In fair weather or foul, we had to make our own entertainment. Our props were what we had around us and our imaginations. 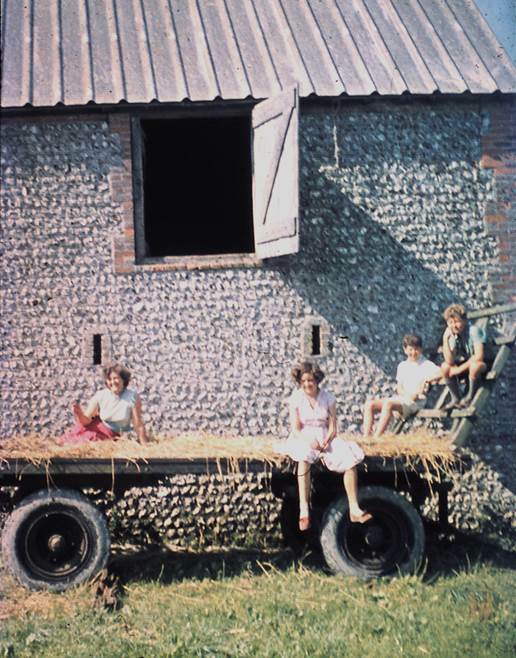 This wonderful old Sussex wagon, abandoned by the side of a track, was one prop and there we have me on the left, my sister and my brother temporarily stopping our game and posing for my dad’s camera. Actually, there were probably three different games going on in three different imaginations. My sister imagined the wagon to be a ship, sailing the seven seas and going to exotic places that were only in her, older head. I don’t know what my brother imagined – he died more than thirty years ago, so I’ll try and put myself in his mind. I suspect his version would have been nearer the truth of what we were on. It would have been a Wild West wagon, racing across the prairies. We didn’t have (at home) a TV and cowboy programs were a bit alien to us, except that through the thin walls which separated our house from our neighbour’s we could hear the clatter of hooves and the roll of the wheels, the sharp report of gunfire and the conversations between members of the cast from their TV. My brother was always a bit of a dare devil – so that’s how I think he’d have seen this old wagon. It’ll come as no surprise that for me it was a train and I was the driver. Now how dull is that – except of course that it wasn’t dull as my imagined train raced on at 75 mph, up hill, through tunnels, down dale and across spectacular viaducts. But back to that picture. A couple of days ago I posted my long ago written piece about camp and in it I mentioned a tarpaulin over the bikes, which was always called ‘The Garage’. Well there it is tied on to the wagon and with the bikes under it. Those oh so simple days, devoid of much contact with the outside world, with an absence of news, were also oh so happy. Present day youngsters will find it hard to imagine how we coped with no computer, tablet, smart phone, let alone TV but these items, I judge, have not actually made youngsters happier. Yes, I’d find it hard to cope without my computer these days, but I’m glad that we learned how to entertain ourselves.